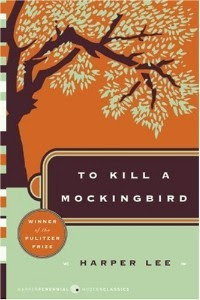 Today is the 50th Anniversary of the original publication of To Kill a Mockingbird! I thought I would post a review of it since it is one of my all-time favorites. Every single aspect of To Kill a Mockingbird is phenomenal. I would give anything to have more books featuring the same people, or at least the same place. I also desperately wish this was not the only book published by Harper Lee. The setting: Southern. The South is one of my favorite settings, and no one does it better than Harper Lee in this book. Not only in her descriptions of the surroundings, but in the way she so expertly describes the interactions of neighbors in the small town of Maycomb, Alabama. The characters are all multi-dimensional. Scout and Jem are so much fun to read about, I love their brother/sister dynamics. I also love their sometimes formal/sometimes familiar relationship with Atticus. And…who doesn’t love the antics of Dill? Their interactions with Boo Radley (whether the real or imaginary ones) are entertaining, suspenseful, humorous and even poignant. The themes of bigotry and racism that are so expertly and emotionally weaved through the story are some of the best ever written. Especially since this book is written to reach younger readers. So many generations of students have studied this book, and I can only hope they continue to do so. If you haven’t read To Kill a Mockingbird by Harper Lee…you’re crazy! Run…don’t walk…RUN to the library. Happy birthday to a classic! Nice review! Have you just read this now, or is this an old review? I read this book for the first time as a grown woman – last year – and wonder how that has skewed my perception or reaction to the novel. Guess I will never know…. !